As empty glass bottles were stacking up here at L’Ane Vert, we had the idea of recycling them to make a glass bottle wall in our flowery garden! We’re loving the result! We were impressed with how easy and cheap it was to make it as well as the little amount of tools it required! Here’s how you can also make your own! 1) Start by soaking the bottles in water for a little while so you can easily remove the labels. If there’s any sticky residue, we found that mixing equal parts of baking soda and cooking oil and applying it on the sticky parts works well. 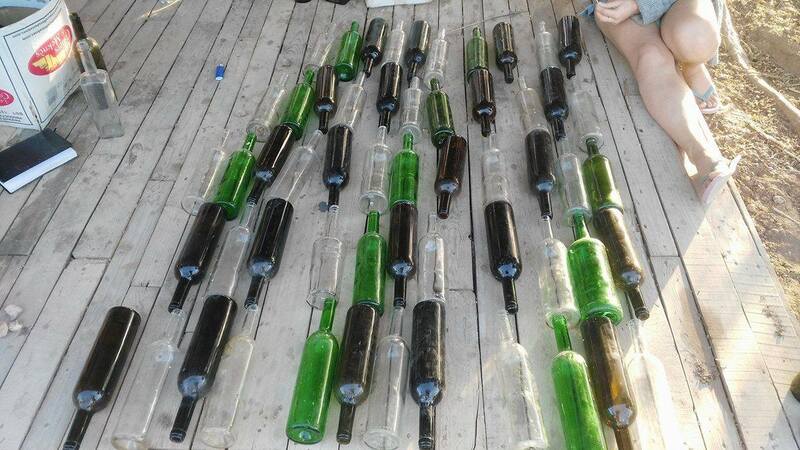 2) Drill holes at the bottom of each bottle. Insert the bottle in a bucket of sand so it doesn’t move, and use a drill. Only lightly press the bottom and you should have a drilled bottle! 3) Have fun designing the patterns, mixing the shapes and colors. 4) We used a big log of wood that we buried in the ground as the bottom base, and a metal pipe for the top part because that’s what we had at our disposal. However, the foundations, both vertical and horizontal, can be whatever you want/can be recycled! Put them into place. 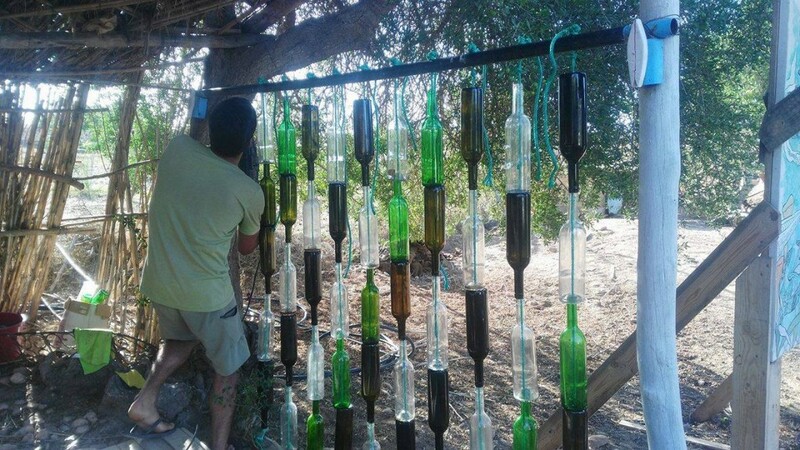 5) Pile up the bottles on strong rope strings and fix them onto the two horizontal foundations. 6) You now have your own very cool looking glass bottle wall!